Fastly offers a variety of accounts and pricing plans, which we detail below. To estimate your monthly charges using our pricing estimator, see our pricing page. We offer a development trial that allows you to test our services free of charge. Simply sign up for a trial and begin testing. We allow you to test up to $50 of traffic for free to ensure everything fits your requirements. 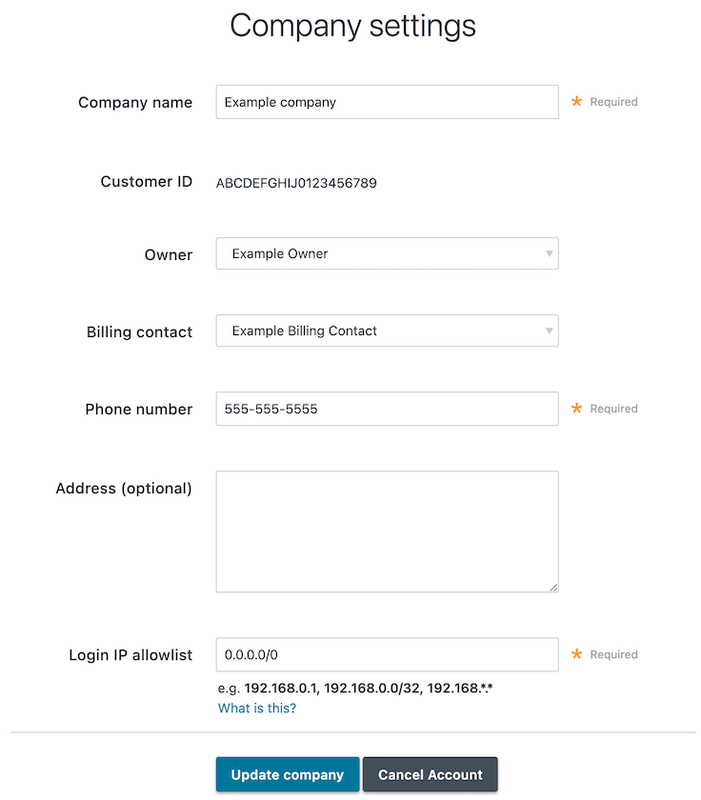 Once your testing is complete and you're ready to start pushing production traffic our way, you can switch your account to a paid account by adding your credit card information. Some add-on options (our TLS certificate options, for example) require you to switch your account to a paid account before that functionality becomes available to you. After your trial period ends, you can use Fastly's services on a month-to-month basis without having to sign a contract. Be sure you've provided us with your current billing address as well as your credit card information. Log in to the Fastly web interface. 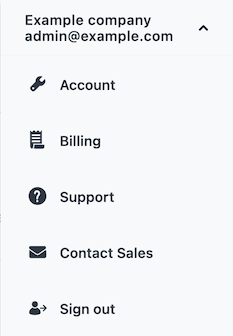 From the user menu, select Billing. Your account's billing information appears. Click the Upgrade account link. Information about your plan's current account type appears. Click the Paid account plan option. Agree to Fastly's Terms of Service by selecting the I agree to the terms of service checkbox. Click the Upgrade Account button. The development trial option disappears. 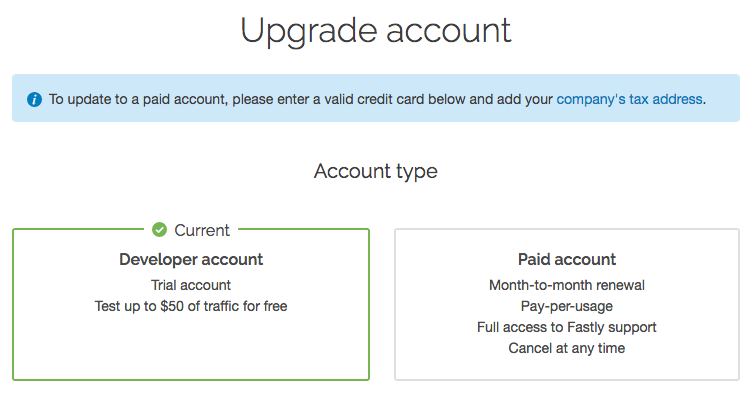 Once you switch to a paid account, the developer account plan option disappears and we'll begin billing you automatically at the end of every month using your credit card information. You can cancel your paid account at any time. If you plan to push at least 2TB of data per month and require one of our TLS service options, or if you plan to push a minimum of 4TB of data per month, it might be worthwhile to consider a contract with Fastly. Contact us at sales@fastly.com for more information. We also offer solutions targeted to the needs of specific industries. We're active open source contributors and support the community whenever possible. If you're an open source developer, your bill is on us. Contact us at community@fastly.com to get started. Deactivate and then delete all services on your account. If you've purchased one of Fastly's shared certificate options, delete your TLS domains. If you’ve purchased one of Fastly's hosted or managed certificate options, contact support@fastly.com to begin the process of deleting your certificates. From the user menu, click Account. Your account information appears. In the Company settings area, click the Cancel Account button. In the Your password field of the confirmation window, type the password associated with your account and click Confirm and Cancel. After your account is canceled, you'll be billed for any outstanding charges accrued through the day you canceled. For questions about your final billing statement, contact our billing team for assistance. If you decide at a later date to reactivate your account, contact Customer Support and request reactivation.